Liquid Nitrogen, most commonly known as LN2 is being used widely in the world to prepare frozen treats, ice cream, frozen yogurt and now dragon breath frozen food. Use LN2 to prepare the delicious and unique desserts and frozen treats. With Aussieblends you can find all the cryogenic technology in a single place. Experience our service to help you setup your systems and store to safely use LN2. Our Liquid Nitrogen systems are made 100% in USA, is the most reliable equipment in the market today. The system control valve is stainless Steel, enclosing case is made of hard anodized aluminum to protect the valve and the handle is stainless steel. Our systems are widely used to prepare frozen treats or frozen food to obtain the dragon breath effect. 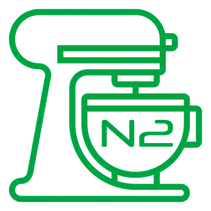 Rust proof guaranteed: AussieBlends is the only company in the world able to prevent corrosion in the Vollrath 7Q machine, this mixer is used in the Nitro 7Q. Vollrath service center: Aussieblends can service and repair your Nitro 7Q liquid Nitrogen machine.